The Best Tailoring blogs from thousands of top Tailoring blogs in our index using search and social metrics. Data will be refreshed once a week. Tailoring newsletter is a comprehensive summary of the day's most important blog posts and news articles from the best Tailoring websites on the web, and delivered to your email inbox each morning. To subscribe, simply provide us with your email address. York, England About Blog Mullen & Mullen is a nationally renowned bespoke tailor, famous for the quality, feel and fit of their bespoke suits and garments, all proudly Made in Yorkshire. Facebook fans 309. Twitter followers 5,467. Kuala Lumpur, Malaysia About Blog Kinslager is a German Tailoring specialist based in Malaysia - whom offers bespoke Tailoring & Designs. In Kinslager Tailoring blog you will learn about tailor made suits or bespoke suits, ladies suits, tailored shirts, tailoring fabrics, pocket squares or other accessories or simply about anything related to tailoring and suits. Facebook fans 21,773. Twitter followers 55. Toronto Canada About Blog Garrison Bespoke specializes in custom made tailored suits, shirts & formal wear. The Journal is constantly being updated to incorporate the latest custom suits bespoke suits and made-to-measure suits. Please post your thoughts. Facebook fans n/a. Twitter followers 1,175. London About Blog Permanent Style is the biggest blog in Europe for tailoring and high-end menswear. Founded in 2007, it has become the authority for classic style and bespoke clothing, with up to 300,000 pageviews every month. Facebook fans 6,978. Twitter followers 6,990. About Blog Matt Spaiser is a graphic designer located in New York. After years of research, he founded The Suits of James Bond in 2010, creating the ultimate resource for James Bond style and the first catalogue of all of 007’s outfits. Facebook fans 2,617. Twitter followers n/a. 13 Savile Row, London W1S 3NE About Blog At Cad & The Dandy we have a passion for all things tailoring. We don’t over complicate things, operating from premises in Savile Row and The City, with our trained Savile Row tailors, cutters and finishers. We offer three grades of tailored suit: fully hand-stitched, half hand-stitched and machine stitched. All of our suits start with pattern creation, done by hand and retained for future orders. Facebook fans 3,344. Twitter followers 3,249. Bangkok & Thailand About Blog Tailor On Ten is a bespoke tailor founded by two Canadian brothers, Alex and Ben. Our mission is to make clothes that you will love for years to come. Discover a true bespoke experience. Facebook fans 4,996. Twitter followers 219. About Blog Senszio is the perfect marriage of tradition and forward fashion – the fine art of tailoring delivered with a contemporary twist. At Senszio, the quality of your bespoke suit is ensured by a team of four highly experienced specialists. Facebook fans 2,272. Twitter followers 165. About Blog Garrison Tailors clothes are made by craftsmen using the very best British fabrics. Our intention is to make clothes for the present day, not for fancy dress parties. These are not costumes, they are part of a wider trend toward a new kind of men’s clothing. Facebook fans 8,397. Twitter followers 613. About Blog Bookster was founded in 2003, specialising in finding and selling the best vintage & classic tweed clothing. About Blog Mia’s Bridal & Tailoring began over 20 years ago, when owner Mia Dohrman expanded her tailoring business to include wedding gowns, bridesmaid & other attendant dresses, and tuxedo rentals. Facebook fans 3,473. Twitter followers n/a. Chandler Arizona About Blog Artful Tailoring is the top custom tailor in Arizona that offers bespoke suits, in-house tailors, custom shirts, bridal alterations, wedding packages, and much more. Facebook fans 245. Twitter followers 35. About Blog Bucktrout Tailoring is a family-owned clothing label with over 50 years of craft and expertise. Syston Leicester About Blog Michelle Pye is the backbone of the English Couture Company with a vast experience of Dressmaking & Tailoring. Michelle started her sewing life at the age of 6 years old when she used to see her Mum sewing & drove her mad by jumping on to the machine as soon as she went to do some pressing. Facebook fans 561. Twitter followers 3,863. Scotland, United Kingdom About Blog Roseberry Tailoring are experts in bespoke tailoring and sartorial advice for both men and women. Roseberry Tailoring specialise in the creation of bespoke suits, jackets, coats, shirts and accessories for men and women. Facebook fans 1,165. Twitter followers 385. Newtown Square, PA About Blog Situated on Chapel Road in historic Newtown Square, Pennsylvania, the D&B shop has stood for nearly half a century as a bastion of old-world craftsmanship and timeless style. We work with each client individually to achieve a perfect fit and to help them design their one-of-a-kind suits, dresses, coats, gowns, and shirts. Facebook fans 273. Twitter followers 19. About Blog One of the oldest since 1971 and most Experience Tailors in Singapore. We are one of Singapore's few remaining authentic Bespoke Tailors who create Ladies and Gents Suits, Shirts and other custom made clothes by hand, which is still considered an art by Master Tailors internationally. Ireland & UK Locations. About Blog A Hand Tailored Suit creates bespoke custom garments for Men & Women. We source only the finest of cloth from only the finest of cloth merchant. Facebook fans 7,916. Twitter followers 7,076. Lincoln & London About Blog Andrew J Musson – Born in the beautiful City of Lincoln, as a child I grew up surrounded by tailoring as my father John Musson, up until the handover of his long running very successful tailoring business (formerly known as ‘Victor Paterson’), gave me the foundation of my tailoring career. Facebook fans 4,760. Twitter followers n/a. London, England About Blog A tailoring guide for busy men and women in the City who want to dress well and look good. Threadgold was created to help busy men in the city look their best. Offering both made to measure and bespoke, we visit you at the office or at home. Facebook fans 93. Twitter followers 16. Alcester, Warwickshire About Blog Robinson Tailors is a family run Business located in Alcester, Warwickshire. We hand make bespoke Jackets, Trousers & suits to our customers requirements. Facebook fans 107. Twitter followers 919. About Blog Walter the Tailor has catered to the city's most discerning ever since, altering existing wardrobe pieces, repairing favourites, and completely redesgining entire wardrobes. For men, and those women that enjoy the cut and feel of pants, suits, and jackets, Walter The Tailor can make you feel better, by looking better. Facebook fans 707. Twitter followers 217. New York, USA About Blog Fine Threads Bespoke Tailors is yet another flourishing fashion business venture by Michael Lalwani along with Ashok Varshney in the city of New York, USA, carving a niche as the Best Tailors in New York. Facebook fans 326. Twitter followers 206. About Blog A Tailoring Blog by Tailor's Touch. Facebook fans 279. Twitter followers n/a. About Blog Knights & Lords creates Bespoke suits through the Drape cut method of suit making which was originally founded by Anderson & Sheppard in Savile Row. Its Directors, Ashish & Pawan strive to open peoples Eye Of Bespoke through their craft. Facebook fans 1,261. Twitter followers n/a. 89 rochester row, sw1p 1lj About Blog Bespoke Tailors in London since 1946. Hand crafting and custom tailoring of the finest suits, bridegroom wear, formal dress, overcoats and alterations. Facebook fans 255. Twitter followers 122. Amsterdam, Overtoom 373 About Blog De Oost Bespoke Tailoring. We tailor quality suits, shirts, jackets for ladies & gentlemen in Amsterdam. Facebook fans 575. Twitter followers 616. SF | LA | NYC About Blog Vesey Exclusive Bespoke Clothiers offers a complete custom wardrobe and accessory options for the professional and the creative individual. Facebook fans 111. Twitter followers 17. About Blog A Custom Tailoring Blog by All Alterations. London About Blog Apsley Tailors, established in 1889, offers luxury, handmade, bespoke tailoring of exceptional quality, in great speed and for excellent value. Facebook fans 10,248. Twitter followers 2,414. About Blog Oliver Häberli is a professional tailor and entrepreneur with more than 20 years of experience in manufacturing and retail of hand-made full-bespoke garments for men & women. Bangkok, Thailand About Blog Lee Fashion Tailor creates a variety of clothing for our customers, usually taking classic styling cues and merging them with modern cuts, fabrics, colors and detailing. We are proud to be able to take the otherwise "conservative" nature of gentleman's and ladies custom clothing into the modern age. Facebook fans 5,043. Twitter followers 44. About Blog DRAFTERS is a unique tailoring franchise born out of the vision to provide high end clothing at great value to Nigeria’s elites and middle class. Featuring sophisticated designs in the simplest forms, it is the result of a collective obsession to essentially create the most efficient clothing line possible in our local environment. Facebook fans 5,225. Twitter followers 27. Little Rock, AR About Blog Barakat Bespoke is the ultimate boutique for gentlemen that offers custom clothing and meticulously chosen ready to wear. We combine classic style and contemporary style with a hint of boldness. Facebook fans 5,909. Twitter followers 86. About Blog At Keye London we provide a unique tailoring experience which is slick and sophisticated. We offer every client a safe environment to express themselves, (“their inner fashion”) we will of course be on hand to guide you through the design process. About Blog Joyce Murphy established JSM Tailoring Tools in January 2000 as a business dedicated to helping those who tailor and design garments for a living or who teach others these skills, to find success in their chosen careers or sidelines. manchester, uk About Blog Dispensing personal tailoring garments and seasonal collections to the gentlemen of England's northwest. These include jackets, trouser, shirts, ties, and accessories. Facebook fans 1,278. Twitter followers 515. England, United Kingdom About Blog Zebel is a bespoke tailoring company, we specialize in tailor made garments. Facebook fans 3,694. Twitter followers 2,224. About Blog Checkout FitWel blog to know about custom suits style stories and bespoke clothing, custom tailored Shirts, Jackets, Pants, Blazers and latest fashion trends in the USA. Facebook fans 1,220. Twitter followers 15. Mumbai, India About Blog Bombay Tailor provides great suits that befit you and your lifestyle. We specialised in Men and Women corporate wear suits & Blazers. Our suits are made from the highest quality fabrics and guaranteed to give you functionality, durability and comfort. Our skilled master tailors handle all of our cutting and sewing, ensuring precision in all production processes. Facebook fans 1,733. Twitter followers 22. About Blog I am a theatrical costume cutter/tailor at North America's largest repertory theatre. I've been working in the theatre since 1986, and have the privelege of working with many of the top-notch designers in Canada, the US and the UK. About Blog Fields Menswear supply an array of stylish mens designer clothing for the fashion conscious. Whether you are looking for new wardrobe staples or a new look, Fields Menswear have plenty of collections for you to choose from. Facebook fans 429. Twitter followers 197. 11 St. George Street London About Blog Steven Hitchcock is an independent Savile Row tailor at the forefront of luxurious soft tailoring, a craft passed on to him by his father John Hitchcock. Steven has made suits for rockstars Michelin star chefs and his most famous client H.R.H. In this blog you will find posts on traditional tailoring, bespoke hand cut suits, cloths and fitting guides. Facebook fans 754. Twitter followers 1,937. About Blog Love Your Tailor is a Toronto based tailor and clothing alterations factory offering world class tailoring and alterations services to Toronto. About Blog TAILORING, SIMPLIFIED. At Tailors Mark, we use technology to simplify the tailoring process, which means you can be sized, fitted, and ready to order online in just a few seconds. Here you will find Style advice, trends and fashion inspiration for Australian men. Facebook fans 11,201. Twitter followers 181. About Blog The publication is a leading European blog and journal about bespoke tailoring, handmade shoes, fine shirts and all those major and minor components that create true style. Facebook fans 326. Twitter followers 271. T: MIA About Blog Tailor-M is an online tailoring platform for people to discover & meet their ideal tailors for custom-made suits, shirts, jackets, dresses, etc. Tailor-M connects people with over 400 tailors. There are also news keeping people informed of tailoring tips, latest trends and special offers. Facebook fans 2,002. Twitter followers 3. Windsor, Colorado About Blog The men behind the label are Ron, Ryan, and Brett. Bespoke Edge provides the absolute best in suiting and shirting for the discerning Colorado man. Ryan handles the majority of the blogging. His aim is to curate content that answers the practical style questions that so many men have. He loves researching the origins of menswear and and how to build a spectacular wedding suit. Facebook fans 441. Twitter followers 106. No.17 Clifford St, London About Blog The Notebook is a web log from Savile Row tailors Anderson & Sheppard that records the training, growth and development of its apprentices. This is hoped to give visitors an insight into the cutting, tailoring and traditional craft that goes into an Anderson & Sheppard suit, as well as the apprentice programme. Facebook fans 1,067. Twitter followers 111. United Kingdom About Blog Founded in 2004, King & Allen are a bespoke tailoring company who create beautifully tailored suits for men and women. Every part of the suit is uniquely designed to your requirements, from the cloth and the lining to the buttons and the stitching. Read King & Allen's latest men's and women's fashion and style tips from fashion icons and discover expert designers' predictions. Facebook fans 3,764. Twitter followers 14,690. About Blog Graham Browne Bespoke Tailors are located at 12 well court ( off bow lane ) near Cheapside, London and have been in the area 43 years. Cutters Russell and Dan have a military background from their working days at Kashket & partners, so Graham browne’s house cut is waisted and well fitting with high armholes but are open to suggestion. CONGRATULATIONS to every blogger that has made this Top Tailoring Blogs list! 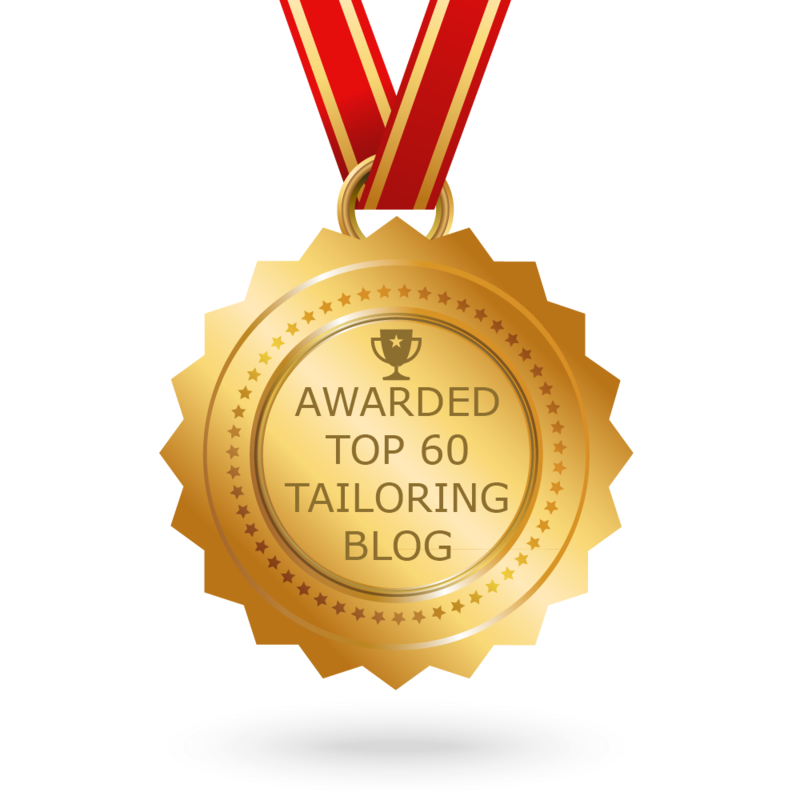 This is the most comprehensive list of best Tailoring blogs on the internet and I’m honoured to have you as part of this! I personally give you a high-five and want to thank you for your contribution to this world.